The spirit manifests itself at all levels in nature and the universe. Quantum mechanics have thoroughly tested our imagination. The tangible world looks so different from the atomic world, but they are different forms of the same physical nature. Different levels of order and their relations are now often researched separately, because their complexity can then at least be fathomed to some extent. See evidence part 1 – 4 and 6 in my book. 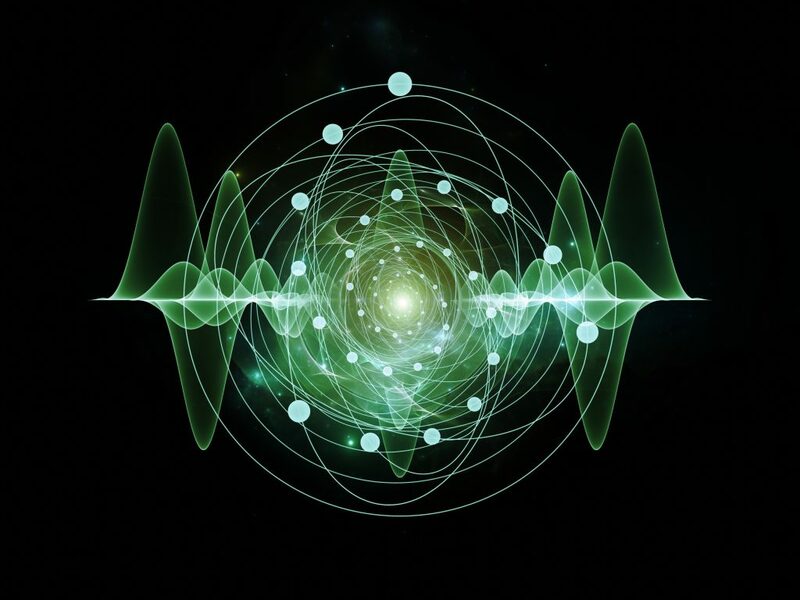 The uncertainty principle about what condition matter and energy waves are in at the moment of observation led to various interpretations (Copenhagen – many worlds – quantum potential, et cetera). Each one with its own strong points, but also with its unanswered questions, such as the role and meaning of the observer or spirit. See evidence part 6 in my book. An objective situation is subjectively influenced by its observer. As a carrier of information and universal memory, the spirit is the timeless and dimensionless intermediary, enabling communication across extremely large distances. See spiritual tissue of gravity. The E.P.R experiment, where two particles cover the same distance in opposite direction, showed that the spinning value of the particles can be reliably predicted despite the great distance between them. Information has to travel faster that the speed of light to obtain this. This is not covered by the theory of relativity. See evidence part 6 and spiritual tissue of gravity. The spinning value always corresponds, irrespective of differences in time and space. In his interpretation, Bohm neutralizes this form of non-locality by introducing the quantum potential, which transfers information through ‘hidden variables’. Unlike other interpretations, Bohm’s interpretation corresponds with the theory of relativity and does not contradict it. See evidence part 4 and 6 and spiritual tissue of gravity. The hidden variables and quantum potential, however, are a mathematical and physical manoeuvre that cannot be expressed in figures. The spirit functions as this hidden carrier of information: since it is not bound by space or time, the spirit can bridge information gaps and create a connection between all matter. How this is done does not fall under the scope of physical science. Expressing it in the bizarre language of noughts and ones seems to offer an opportunity to render this process conceivable. See evidence part 4 and 6 and spiritual tissue of gravity. Physical values, laws, constants, mass and energy ratios are fixed across the entire universe. Minute differences in these ratios would have rendered a different development of the universe. See evidence part 1 – 5 in my book. On an elementary level forces of energy and mass are distributed so that matter can be structured. The universal value of this distribution is a special phenomenon, considering the extreme diversity of the milky way, galaxies and forms of life within our universe. These universal values are stored in the spirit’s memory as a sequence of imaginary numbers. See evidence part 2 and 3 in my book. The ratios of forces, mass and energy are recorded in imaginary number sequences. When measured scientifically, these values appear to represent fixed values ( see evidence 1 – 4 ) that can be reproduced and verified. Because of quantum mechanics the boundaries of mass and energy fade away, whereas the tangible world can be observed so concretely. This is beyond the imagination of many a person. The wave particle duality brings a profound and essential drive and transparency to the study of nature and physics. The boundaries between the dimensions of space and time fade. Time is always directed forward, because the spirit has progress, or evolution, in its ‘genes’. This fundament of the spirit, continuing the instable mirror symmetry between matter and antimatter, renders the spirit a primeval force that instigates evolution. See evidence part 1 and 2 in my book. The spirit has no dimensions of space or time and does not know of any boundaries separating them. This is where the required unification lies. Strong and weak nuclear power, electromagnetic power and gravity are all comprised in the panorama of this desired unification, despite their large differences in scale. See chapter 34 in my book. The spirit’s essential lack of dimensions brings about this unification. The spirit is a cocoon of all matter, and, consequently, has a bearing on all interactions, whatever their scale. As a universal memory, the spirit represents the value of every interaction between mass and energy. This is what makes natural laws and appearances equal across the universe. See evidence part 2 in my book. The spirit is a number sequence that can be compared to a helix of chromosomes, consisting of elaborate base and genes combinations. Collision tests in the particle accelerator showed the existence of many elements of protons, neutrons and electrons even at an elementary atomic level. Entirely new families of particles were traced and classified according to scientific principles. See evidence part 2 and 3 in my book. Various mirror symmetries ( see evidence 1 and 3 ) of values were discovered. In theoretic models gravity does not comprise these elementary fundamental forces. We need to find gravitons in order to include gravity in an all-encompassing theory. But even if this missing link was found, questions about what drives the creation of organic forms of awareness would remain unanswered.